Good news for the team at Vyke — their Mobile VoIP service is now availalbe in Nokia’s Download store. Which must put it on.. what.. a good few million handsets right-away. They’re passionate folk at Vyke — I met Aaron a while ago and found him a switched on chap — so I’m sure they’ll be delighted at this news. If you haven’t checked out your download store recently, have a look. You should hopefully find Vyke there. Vyke’s mobile VoIP software is found in the Download store, which is located in the main menu of compatible Nokia mobile phones. Once the download is started, the software installation and set-up process takes approximately 2 minutes to create the user’s Vyke account and top it up with $1 of free calling credit. Any Cloud hotspot? Wow. There are tons of The Cloud hotspots across the UK. I’ll need to try that out. Thankfully Vyke will work on almost any decent E and N-Series Nokia handset including the E90. SMSC Crime – an issue? I can’t seem to find Vyke in my downloads, likely because I’m in the US. Vyke has licensed Nokia to distribute the mobile handset software component of the Vyke Mobile IP service. New users acquired via the Nokia on-device content portal ‘Download!’ will automatically be directed to Vyke’s end user communications portal and have accounts created simply within the Vyke system. i LOVE truphone, but i was interested in vyke because the flat rate per call is cheaper than the per minute rate truphone provides (after the all-you-can-eat free plan expires). I have been using Vyke Pro for about 2-3 weeks, and I must say that I’m quite happy with the service, if not with the pricing for calling from Oman – for each call, one has to pay for two legs: First they call you, then call the number you want – then connect the two of you. The quality is fine, but a call from Oman to say India costs about 35c per minute. However, their text messages (sms) is very inexpensive, and they certainly do not charge anything more than they represent on their website. I am the CMO of Vyke and wanted to briefly comment on the above postings. 1) Please note that Vyke Mobile and Mobile IP are two completely different products. – Mobile VoIP is a pure mobile VoIP product which is cheaper to use, but as of now only works on a select range of Nokia dual radio phones. If you cannot find Vyke Mobil IP on your Nokia handset, you can download it from http://plugin.vyke.com alternatively you can sign-up for a free Vyke account and download it from http://www.vyke.com. Note that for selected countries, you also get $1 free so you can test before using. 2) Payment . It is correct, that we do not offer this service in the USA, thus you cannot use US credit cards. You can use CashU and soon more payments options will be available. Vyke is brushing up its website and sometime in April, you will be able to access more pages without being loged in. As a final remark, I want to stress the difference between Mobile VoIP and the Vyke Mobile product. Vyke Mobile uses callback to set-up a call back to your phone and then connect you to the person you like to call. this makes it a bit more expensive than Mobile VoIP, but if your handset is not compatible, it provides a great way of saving on internaitoanl calls. It also has the Call@ feature which allows you to set-up a call between i.e. a fixed phone in a hotel room when you are travelling and the phone back home you like to call. This sets up the call between the two phones using your Vyke account and you save on all romaing charges. Im using vyke since 2006 and I was quite happy mainly with your cheap and very reliable SMS service. Also, the J2ME was self-explanatory and easy to use. After releasing the new Vyke Lite and Vyke Pro – without any notice – I’m some irritated. Cause your customer support do answer very slow, I would like to take the liberty and to post my last mail. I’l be glad if you can give some feedback on it. At first thank you very much for your reply. Please take 10 minutes to read my comments and to forward them to your decision makers in order to prevent customer loss. You wrote, the system number appearing as Sender-ID is beeing set up to prevent from the fault use where the user is able to change his callback number inside the application. Where is the logic of this consideration? As you know neither on leg A (the callback-number) the user is seeing the number of leg B (the destination number) nor vice versa (destination number can see the callback number). Every time when I’m using callback I receive the callback with a strange US-Caller-ID. The destination number is seeing another “strange” Caller-ID but not the Caller-ID of the callback number. In this case it is much more better to suppress the Caller-ID completely instead of signalling the wrong one. So where is logic and the connection between this fact and the sender-ID of the SMS? I dont see any one… Even if vyke is able to set the correct crossed caller-IDs on a callback-call (so the called person can see the callback number-ID) the sender-ID of the SMS must’n match the callback number. In the old Vyke version it was for me a very good solution to set the SMS-sender-ID to the mobile number to which the download-link has been sent. And, objective, the idea with the possiblity to change the callback number is a “nice to have” feature but already available (think an Call@). If you want to see how this theoretical prevention of fault use is solved from your competitors take a look at the Java client from Betamax (attached). You can create an account using any betamax-clone (webcalldirect, voipbuster, nonoh etc.) and use the user and the password in the software. I understand that you want to shift the message use from “client-to-phone” to “client-to-client” in order to reduce your own SMS-costs, am I right? I think in this case your biggiest competitive advantage – the very reliable and cheap SMS transmission worldwide – will drop away. Since your VoIP-rates are considerably above the average, and since the caller-id’s are not working properly, hamstringing your SMS service will keep potential customer off and scare existing away. – the application dont start automatically on some handsets on incoming messages (e.g you can test it on Nokia 6300). – on VykePro you are evidently using other SMS-routes which are noticeable less reliable as the routes used in VykeLite: every SMS sent from VykePro to all Bulgarian Networks WAS LOST, every SMS sent to the German number +4917626373496 was lost and so on… I have not experienced this problems with VykeLite (but unfortunately there is no more a correct Sender-ID). So I would be very glad if you can correct all this issues. You perhaps see, reliability and comfort (especially SMS- and Caller-ID) are for me (and I think, for many of your customers) much more important as the low SMS rate. Since in the past I didn recieve answers on many mails of mine I will not repeat this considerations again. There are finally enough alternatives to switch over but I still would like to remain to vyke. As Vykeâ€™s support team responded to you previously, thank you for your input. As indicated in our response back to you, your comments have been forwarded to our Product Management and R&D teams for consideration. 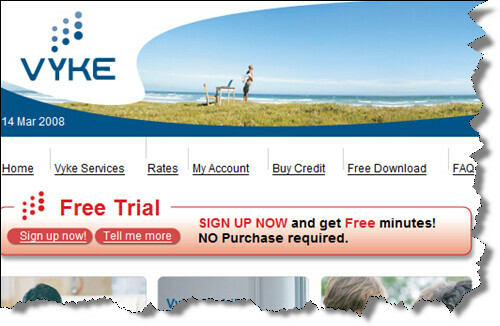 -Per minute pricing: From your email, it appears that you do not use Vyke Mobile IP (our mobile VoIP service). Vykeâ€™s Mobile VoIP service requires the use of a dual mode (GSM and WiFi) mobile phone such as the Nokia E and N series. Please see our Vyke Mobile IP rates, they are very competitive vis-Ã -vis our competitors. Vyke Lite and Vyke Pro both provide their international calling via a callback rather than the VoIP platform used by Vykeâ€™s Mobile VoIP service. Because of the callback structure (i.e. create a callback connection back to your mobile phone first), the per minute cost will forcibly be higher than for a mobile VoIP call. However, the callback call is most likely a lot cheaper than your mobile operatorâ€™s international calling rates (and you donâ€™t need a dual mode mobile phone) â€“ which is the goal with that product. -Caller ID: We would like to support flawless caller ID, but find that some or many of our call termination partners do not reliably support this feature and will often insert their own caller ID. I believe that the issues you are seeing are related. -SMS Originator number on Vyke Lite only: the reason why all SMS sent from Vyke Lite uses using a standard SMS originator ID is that some users attempted to falsify their SMS origination number in order to spoof the mobile phone number of other people. We have now removed this feature to protect our users. Please note that Vyke Pro still sends your mobile phone number as the SMS origination number (as the user verification process for Vyke Pro prevents the spoofing issue from happening). Please change to Vyke Pro if this feature is important to you. -Vyke Pro: It appears that some of Vyke Proâ€™s features need to be clarified… Firstly, Vyke Pro delivers SMS to non-Vyke Pro users as normal SMS with your mobile phone number set as the originator. The peer-to-peer messaging service (between Vyke Pro users) does, as you point out, remove the SMS cost component for Vyke. We have in turn passed this on to you as by making peer-to-peer messaging a FREE service. Please feel free to send text messages to your friends or family for free using Vyke Pro. -SMS from Vyke Lite / Pro to Bulgaria: There is no difference in SMS routing quality between the previous generation Vyke Mobile, Vyke Lite and Vyke Pro. The support team has reviewed your account usage history and sees that there have been many attempts to send SMS to Bulgarian numbers. Based on your above comments, we have refunded these SMS charges to your account. However, please send Vyke Support an email indicating the time, date and phone numbers to which you were unable to send an SMS. The billing system of the SMS termination providers concerned indicated to Vyke that these messages had been delivered. Please help us solve this issue by reporting these SMS delivery issues. I thank you for your choice in using Vyke and I hope that, overall, Vyke provides you a valuable and easy to use service. As previously indicated, we did forward your comments and ideas to our product teams and we thank you for the time and effort you have put into your suggestions. I tried to install Vyke Mobile IP on my E90 communicator – first of all had to pay to get access to the downloads – then the installation stops as soon as it gets to configuration. Since 21st March have had a total of 3 responses from Vyke all repeating exactly the same thing. So now Vyke have the money – which needs to be used within 6 mths – and cannot even be bothered to respond to the queries despite me even raising ideas that may be contributing to the problem, listing the process step by step and offering to send screenshots So if you want to take a wild chance on losing some money then go for it – otherwise find a different way to throw your cash away. Can you please send your Vyke user ID? We take support issues such as the ones that you identified very seriously and I would like to take corrective action. Additionally, please describe the manner in which you were charged money to access Vyke in the Nokia Download! store as this should not occur. Please submit the your response to support@vyke.com and, in the request, ask the first line support team to forward your message directly to Aaron Powers, Head of Support and Administration. thank you for the attention you have given this problem and the flurry of activity that has since occurred – I can report that my E90 Handset is now working with both the Vyke Pro and the Mobile IP software. As regards the software, at this early stage they both appear to be very useful services for my own situation so I am pleased that we have persevered in getting them installed. As regards my previous comments that Vyke ‘appeared’ not to be bothered – well subsequently with a flurry of activity and suggestions that trend is well and truly reveresed, it may have taken a few days and a few niggles but we got there and the help was there when we dug deep. Outcome – not only pleased with my own instalations now but pleased to also be suggesting them to friends and family who also seem pleased with the services they are now accessing !